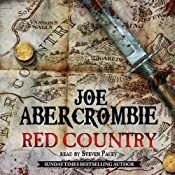 There have been a lot of people waiting for this news: Steven Pacey’s performance of Joe Abercrombie’s latest novel, Red Country, was released on audio this week! Dark fantasy meets unforgiving western in this standalone tale of one woman’s struggle to find her kidnapped brother and sister. Shy South comes home to her farm to find a blackened shell; her brother and sister have been stolen and she sets off in grim pursuit with only her cowardly old step-father for company. But it turns out he’s hiding a bloody past of his own. None bloodier.